With the 2018 season soon to get underway, it's time to run you through Sky Sports' biggest-ever season of NFL action. 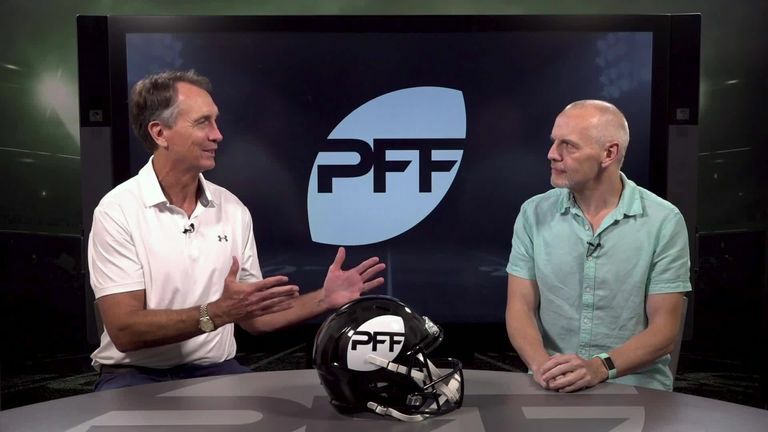 From live coverage and the thrill-a-minute Redzone with Scott Hanson, to a feast of new programming centering on Jay Ajayi, the Super Bowl LII story and NFL Europe and more, the NFL is essential viewing - not just on Game Day but every day of the year. Sky Sports Action (channel 408) will be our home and Sky Sports NFL will be taking over the channel for the whole of opening week - here's what you can expect across the season. The action begins in the early hours of Friday when returning champions Philadelphia Eagles start the defence of their first Lombardi Trophy by playing host to the explosive Atlanta Falcons, who have the incentive of this year's Super Bowl being played at their magnificent Mercedes Benz Stadium - and we'll be there in February! Opening Sunday features three blockbuster matches starting with San Francisco 49ers at the Minnesota Vikings, followed by the Carolina Panthers hosting the Dallas Cowboys and the storied NFC North rivalry from Lambeau Field between the Green Bay Packers and the Chicago Bears. Follow all the excitement of the 2018 season by playing the NFL Challenge, with weekly prizes and the chance to win a pair of season tickets to the 2019 games in London. Our Sunday coverage will be bigger than ever as we go from half an hour to an hour of build-up. Neil Reynolds will lead the team that will provide insight throughout the season - Rob Ryan is back and, with Jeff Reinebold, will give us a coach's perspective on the action while our rolling cavalcade of former NFL stars will feature Shaun Gayle, Solomon Wilcots, Takeo Spikes and Bucky Brooks. We will also have insight from Peter King, Brian Baldinger and Ross Tucker via video link throughout the season. As ever our friends from the Around the NFL podcast will add a touch of mirth to proceedings - and they'll be joining us in the studio for opening week. Monday Night Football is back again (although it's the early hours of Tuesday for us), and we start with the added bonus of two MNF games in opening week as the New York Jets travel to the Detroit Lions before west coast fever takes over with the Oakland Raiders hosting the Los Angeles Rams. There's been no offseason for us as we've been making a host of documentaries, masterclasses and special programming that will supplement a range of content already available on Sky Sports thanks to NFL Films. As ever, highlights of all the live games will be available and that will be joined by the whole catalogue of America's Game, Hard Knocks and A Football Life. Recording Inside the Huddle podcast with @Jeff_Reinebold at 1.30pm today. Lots of training camp chatter, for sure... send us any mailbag questions you might have and we'll answer a selection. We are beefing up the popular Inside the Huddle podcast - this year we are recording every Wednesday at Sky Sports and Neil and Jeff will be joined by an array of guests throughout the season. You will be able to download the podcast on Thursday and watch the 30-minute special On Demand or on Sky Sports Action on Wednesday evenings. Sky Sports' website, app and Twitter feed will keep you up to date with the latest news, plus behind-the-scenes goings on and they'll be a chance to vote and quiz our team of experts. Online we'll keep the news agenda ticking over, live blog the action and our all-new tie up with Pro Football Focus, America's biggest statistical database, will give us in-depth features and analysis as well as preview all our live action with the key head-to-head match-ups. Fans can join in too with an all new NFL UK fantasy game, you can go up against our experts and some of Sky Sports' biggest names - more news coming soon. Periscope and Facebook Live will give us the chance to take you behind the curtain and keep your eyes peeled during the week as there may even be more from the podcast studios, production meetings as well as our live coverage. Join us for coverage of the NFL right through the regular season and play-offs, starting with the season opening Thursday Night Football, right through to Super Bowl LIII in Atlanta on February 3. Draft pick nearly takes out Commissioner!